“So… would you like to know more about Jesus?” Jeff asked somewhat uneasily as we sat across from each other in the dining hall. It was the start of my first year at University of Washington in the fall of 2009. One week prior I had stopped by a table outside my dorm, where a Christian organization was reaching out to students. I wasn’t quite interested, yet I gladly took a free laundry bag and other dorm essentials, and—mostly out of a felt need to reciprocate—I had filled out a survey card indicating I was “maybe interested in knowing more about Jesus.” Jeff had contacted me to follow up on my response to the survey. Sitting together with Jeff, however, I responded to his question with, “Well… thanks, but no…I’m not really religious and not exactly interested, to be honest.” Yet, I asked him how he came to be involved in that work. Jeff explained to me how he came into a personal relationship with God as a college student, and how the Lord then brought him to Seattle with a calling to reach college students with the gospel. I nodded along to his story with increasingly piqued interest, while taking note of both his timid demeanor and the sincerity that pervaded his speech. Though he seemed a bit uneasy, he was present and available with me. I engaged him with questions/reservations I had about Christianity and faith. “Isn’t the Bible irrelevant to follow today since it was written thousands of years ago? How is there a hell if God is loving and fair? And why do we have so much evil and tragedies going on if this good, all-powerful God is real?” For over an hour, I pummeled poor Jeff, who struggled to answer, and eventually we parted ways. Once home, Jeff, discouraged from meeting yet another hard-hearted UW student, was but a moment away from throwing away my contact card. Yet, he held onto my “maybe.” Something in his heart gripped him to pray for my salvation. A couple months later, while home in Los Angeles for Thanksgiving break, I decided to join my high school friends to their church. By God’s grace, I started to understand my emptiness and utter brokenness and need for a Savior, a loving and merciful Jesus. Furthermore, the mental hang-ups and barriers I once held to following the Lord exchanged themselves for opportunities and ways to further know Him, all out of my growing, new-found love/surrender for Jesus Christ. And my personal relationship with the Lord started to change everything. Much of my growth in Christ happened on the college campus. By God’s rather divine arrangement, the very first friend that I made during orientation week invited me to a Bible study. As I committed my life to the Lord my freshman year and became involved in the community. The leader of this ministry, who regularly meets up with Jeff, exclaims that there is an Asian American guy from LA who just received Christ and has been attending their Bible studies. A light bulb goes on in Jeff. This is the same difficult freshman he spoke with earlier in the school year and prayed for! He rejoices in the Lord for my new relationship with God and the small, yet profound role he got to play in my spiritual journey. By God’s grace, I learned that my role as a student and child of God is not to be a passive consumer, but an active participant and witness for His glory. I was also discipled by a campus ministry staff who cared for my soul, spurred me on towards surrendered commitment to Jesus. I learned the importance of humility in leadership through serving and gained a passion for God’s work through mission trips and student conferences/retreats. As I served the Lord via campus ministry, I was captivated to answer His call to work in college ministry upon graduation (one year part-time and two full-time internship years). These years were pivotal in getting to be a witness of God’s work in students’ lives and receiving His grace for my own journey and growth. Recently, my wife Rose and I also joined full-time staff with Cru (the U.S. ministry of Campus Crusade for Christ), the same ministry Jeff was with when I first met him. May the Lord raise up more students like me, distant and separated from God, to a vital relationship with Himself within Christ-centered community and the local church, with a life-long passion for spreading His beauty, truth, and goodness. May we be a people that live by faith and pray, believing in the Lord’s work. We never know how God can use even one conversation or prayer, no matter how awkward, daunting, or discouraging. He is surely doing His work. May we share the good news of Jesus Christ and engage in discipleship in the power of the Holy Spirit, leaving all the results to Him. Knowing that He is the good, sovereign Orchestrator in His story of amazing grace, may we know our labor in the Lord eternally matters. Last Sunday we presented Luke Davis to the church as a pastoral candidate. We are taking the next four weeks to give you time to meet with him, ask questions and/or express any concerns you may have. One of the over-arching qualifications for a pastor is that he must be “above reproach” (1Tim 3:1). This waiting period is our attempt to ensure all bases are covered and you have an opportunity to speak into the process. Luke will not be on DCC’s pastoral staff (i.e. vocational pastor), but will serve as an elder in a volunteer capacity (i.e. lay pastor). Therefore, by necessity, the scope of his pastoral involvement will be limited when compared to a staff pastor. However, his service will be equally significant. As a non-staff pastor Luke will be involved with preaching, counseling, membership interviews, officiating weddings and funerals, elder meetings and practical leadership (which currently includes leading a Cornerstone Community). Our hope is to have many non-staff pastors in the future, as it helps diversify and strengthen the elder team and, therefore, the church. Luke is a good man with integrity, love for Jesus, and for Jesus’ church. As elders we believe he is called, qualified, and ready to be installed as a pastor of Downtown Cornerstone. However, we are taking this time in case you know something that we do not. That said, would you pray for the Davis’ in this season? Would you also pray for our church? It is a sign of God’s grace to us that we have men, like Luke, being raised-up to lead, feed and protect Jesus’ flock. Let’s ask Him for more. 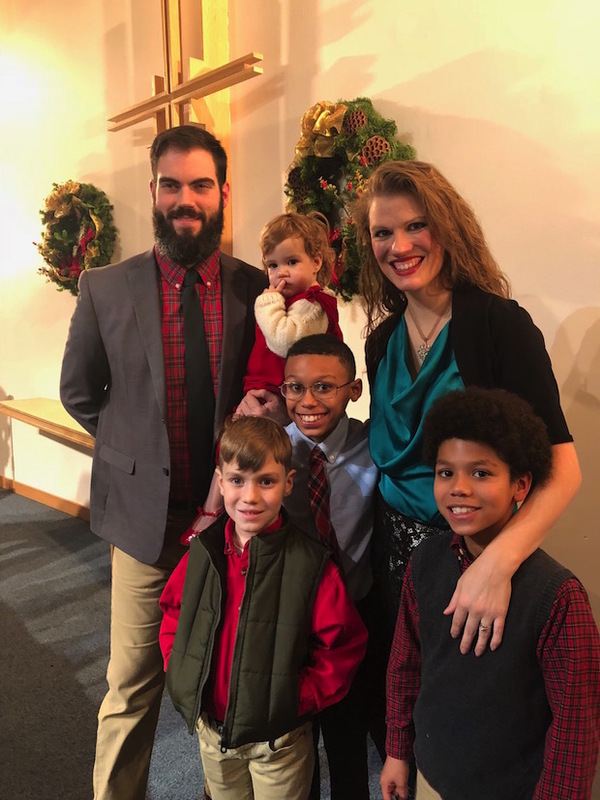 Provided nothing arises that would cause us to stop the process, which we don’t foresee, we will install Luke as our fifth pastor, and first non-vocational pastor, on Sunday, March 18th. It will be a great celebration and a joyous moment. What follows (below) is a short interview with Luke so that you can get to know him a bit better. If you have any questions, comments or concerns you can email me directly at adam@downtowncornerstone.org. LD: God was often on the perimeter of my mind making forays to the forefront around visits to church on Christmas and Easter. The rhythm of my relationship with Him drastically changed when dad decided our family needed to become faithful members of a local church. The timing coincided with my entrance into high school. As the message of the Gospel became clearer my heart put up a fight. I didn’t want to accept that I was busted without Jesus. But the Spirit patiently melted away my crazed attempt to grasp at some measure of merit and Christ became a living hope. I guess just about every area of my life has been affected since following Jesus half a lifetime ago. We would not be in Seattle, for instance, were it not for submitting my vocation to His will. Jesus has been the closest of friends, fulfilling promise after promise. My marriage, family, and work have all been profoundly shaped by Him. LD: My beautiful bride, Lynn, and I have been married for almost a decade (wish us a happy anniversary on March 8th!). Within those years we have welcomed William (10), Ezra (8), Rowan (6), and Haven (1.75). Our little girl is the lone Seattleite in the bunch. The rest of us hale from Florida. LD: I am deeply committed to seeing wisdom and virtue cultivated in the hearts of children. Paul admonishes all parents to bring up their kids in the discipline and instruction of the Lord; to lead them in the way of Jesus. It is a joy of mine to partner with parents as they pass on what it means to be human. LD: It was paramount for Lynn and I to identify a few churches where we could worship in good conscience while considering a move to Seattle. DCC, along with some other churches, appealed to us because of its theology and location. When attempting to line up some personal connections during a first visit to the city, David Parker’s warm communication and generous invitation drew us in like a beacon. Our very first impression of DCC was full of good conversation, camaraderie, Gospel care, and hospitality. The connection was set at that first meeting and we have been celebrating our local church ever since. LD: Within DCC I oversee the Belltown West Community. LD: I have desired to serve the church in this capacity for 16 years. At the simplest level I originally recall a pull to the pastorate when initially reading through 1 Timothy 3 as a young Christian. But discerning the pastoral call should never be done in isolation. The desire grew in clarity, understanding, and affirmation through wise counsel, prayer, and mentoring. My prayer is that our Lord may use me to help lead, feed, guide, and protect the flock. LD: Lord willing, I will be the first lay elder in DCC’s history. That distinction is attended by humbling honor and trepidation. Our pastors expend themselves, body and soul, for the welfare of the church. I need wisdom to walk out this call well in the midst of being a husband, father, headmaster, and citizen of Seattle. Please ask our Father for the grace to serve DCC well without betraying the other responsibilities in my life. Additionally, my family has called Belltown home during the duration of our time in Seattle. As I write this I am surrounded by bins. We are moving just a couple miles east to the Central District within the next week. Leaving Belltown is going to hurt. But we are celebrating our transition to the CD. Please pray for quick connection with neighbors and vision for flourishing within a neighborhood full of historical hurt and triumph.